Skip overrun Capri for the more undiscovered and unassuming island of Ischia Italy. Ischia's food, wine and thermal spas make it a great stop when visiting Southern Italy. I have to admit, I debated writing about my favorite stop in Italy, Ischia. It was my favorite stop because it was the least crowded, and felt the most like authentic Italy. I did love Sorrento and the Amalfi Coast, but it was soooo overrun with tourists. All of those people really take away from the experience, me excluded of course. Ischia wasn't empty, but rather it was full of locals, living their life. Ischia is an island next to Capri. It's a one hour ferry ride from Naples and even closer to Sorrento. There's one major road that circles the island, along the water. A pretty easy to navigate bus system goes all the way around in both directions. The buses do get pretty full, but there's also good taxis too that can take you where you need. 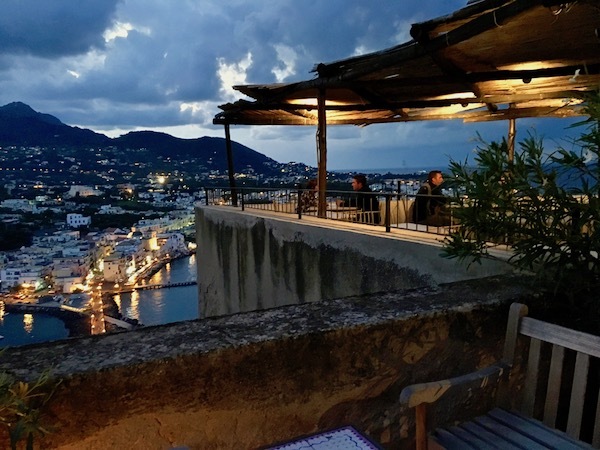 Here are a few stand out places you'll want to see while visiting Ischia. You'll have your bearings at all times when you see Ischia's famous landmark of the Aragonese Castle. It rises nearly 300 feet high and has stood over 2,500 years. The former medieval fortress is worth a climb for amazing views back to Ischia. I couldn't believe that we were nearly the only people walking around the beautiful grounds. You can bring a book and grab a bench and sit and admire the views all day. We loved the Castello Aragonese so much that we came back to eat at the fine dining restaurant, Il Monastero, located on the castle grounds. The prices are quite reasonable for the quality of ingredients. They have an organic garden on site that grows much of the food they serve. I went local while dining at Il Monastero, and tried the Ischia specialty of rabbit. It was simply, but well cooked, and yes, perhaps tasted a bit like chicken. I really enjoyed it. You're going to want time in Ischia to simply stare at the water and admire the Castle. There are many thermal parks on Ischia with multiple pools and activities, but my friend and I just wanted some quiet time to read and enjoy a bite. We got everything we wanted at Gardenia Mare. We stayed in neighboring Ischia Ponte so we caught an easy water taxi the short ride to the beach club. Lunch was a healthy salad, overflowing with great ingredients. It was washed down with a refreshing local wine spritzer with fresh peaches at the bottom. I think we were lucky they didn't sell that by the gallon! A wonderful afternoon. Ischia is actually a volcanic island, which may sound like bad news, but it actually works out well for spa lovers. Volcanic mud has a host of healing properties, and you'll find dozens of spas offering massages, facials, pools and hot springs in which to soak with the local goods. Negombo and Poseidon are bigger names, but we went closer to where we were staying at Terme di Ischia. If you book a service, you get access to the steam room, sauna, pool and salt room before your treatment. Yet another relaxing way to spend the day in Ischia. Ristorante da Ciccio seems like an unassuming restaurant on the path to the Aragonese Castle, but walk by on a Tuesday night and you can't get a table without a reservation. The patio out front is a lovely spot to enjoy the fresh, local fish and wine. Expect well-prepared, and reasonably priced dishes like calamari, pasta and grilled fish. We hadn't left our haven of Ischia Ponte until the third day, when we decided to venture out to try some of the local wines. 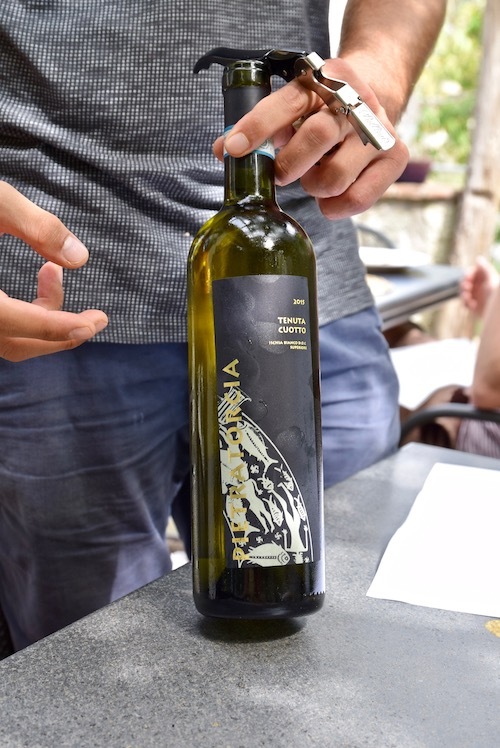 Ischia actually has vineyards growing on the island, producing a range of white and red wines. Pietratorcia offers a nice tasting, alongside a lunch of local meats and cheeses. We were served by the adorable son of the owners. The mother prepared the food, while the father scolded the boy for being too friendly with the two American women. Again, another lovely afternoon. You can get a nice two-fer if you venture out to wine taste at Pietratorcia. On your way to Panza, where the winery is located, you can stop at some of the other beautiful towns along the water like Casamicciola, Forio and Laccoa Ameno. Each has its own charm and great cobblestone streets to work through. We were treated to one fabulous sunset after the next while visiting Ischia. 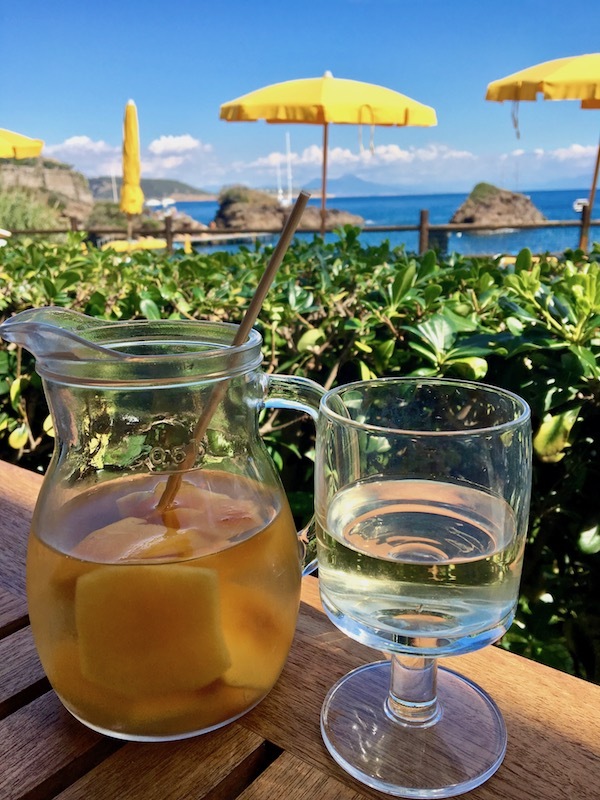 Ischia Ponte has several cafes along the water where you can watch the colors fill the sky while enjoying an aperol spritz. With the Castello Aragonese in the background, you may never want to leave. Sadly, I did have to leave after a few amazing days in Ischia. It was a really special experience and one of the highlights of my trip. I look forward to returning in the future, and I'm crossing my fingers that it retains it's unassuming charm. Did you miss any of my European adventure?